Wash the zucchinis well. There are various ways how to make the spaghetti. You can use a box grater or special vegetable spiralizer. If you don’t have fancy tools, a simple knife will do. 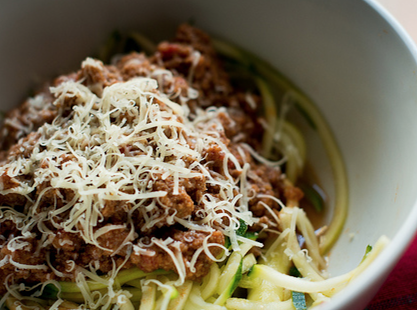 Just make long slices of the zucchini and thinly slice those into noodles. Place on a paper towel to let the moist drain a little. To make the sauce, place the minced meat in a bowl and add the tomato paste along with the salt, pepper and a dash of cinnamon. Mix well. In a sauce pan (or any other big pan) fry tiny diced onions in some coconut oil (or olive oil). When the onions are glazed, you can add the minced meat/tomato paste mixture. Stir well and add half a can (of the tomato paste) of water. When the sauce is almost done, you can add the basil leaves. By replacing the pasta with vegetables, you would have saved yourself from hundreds of calories and you can then top the spaghetti with some nice cheese, guilt-free! Some people prefer to blanche the noodles to take make them a bit more tender. Only boil them for 50/60 seconds.